What's New for the 2019 GMC Acadia? 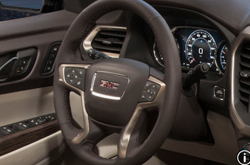 The Acadia still features its stylish body style and the option of two or three rows of seats. It now also offers four new exterior colors. The Acadia will be available in a special Black Edition, which features black exterior elements on the grille, wheels and more. On the SLT-2 and SLE-1 trim level options, the GMC Acadia will now have 17″ x 7.5″ aluminum wheels with P255/65R17 all-terrain blackwall tires. As for the interior, the driver's side will now have express up and down window controls, whereas previous models only had express down controls. Which Trims are Available for the 2019 Acadia? The 2019 GMC Acadia comes in several different trim levels to fit both your lifestyle and your budget. The trims include the SL, SLE-1, SLE-2, SLT-1, SLT-2 and Denali. While the SL model comes only in front-wheel drive, all other models are available in both front-wheel drive and all-wheel drive. All trim levels have six to seven passenger seating. The SL is only available in two colors: quicksilver metallic and summit white while the other trims all feature nine to ten exterior color choices. The Denali trim features the distinctive Denali grille and has chrome accents. The SLT and Denali trims have a convenient power liftgate so that you can open the rear door hands free. 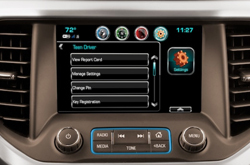 The Denali comes standard with an advanced Infotainment system, and both the Denali and the SLT have a Bose premium 8-speaker audio system. The GMC Acadia offers several engine options so that you have all the power you need while still meeting your fuel economy expectations. The SLE and SLT packages come standard with 2.5L 4-cylinder engines that offer 193 lbs of horsepower and 188 lbs per foot of torque. The 4-cylinder engines have an estimated 23 mpg fuel economy. The Acadia comes standard with a 3.6L V6 engine that offers 310 lbs of horsepower and 271 lbs per foot of torque. The V6 engine can give you a significant amount of towing power. The V6 engine gets around 20 mpg fuel economy. This V6 engine is also available on the SLT packages. 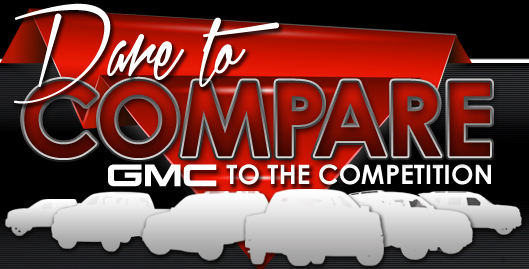 You can contact us for a test drive of the 2019 GMC Acadia. Is the Acadia Safe for Teens? 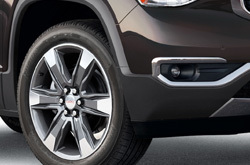 All of the trim levels of the 2019 GMC Acadia have some impressive safety features to ensure you and your family have a safe ride. All come equipped with airbags to keep drivers and passengers safe in the event of a crash. The Acadia has an available lane change assist feature that alerts the driver to a car in the blind spot in the event of a lane change. All trim levels have reverse cameras and have available rear cross traffic alert to further assist the driver in reversing maneuvers. The system will also alert the driver if the car is about to back into something. 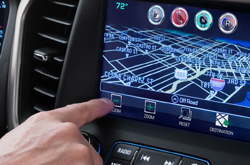 The Acadia even offers Teen Driver modes, which allows parents to set limits on their teen drivers and has safety systems in place to help teen drivers. It even features a report card so that parents can see how their new teen drivers are performing. For those driving with children, the Acadia features rear child safety locks and a rear seat alert, which reminds the driver that there is someone in the backseat. Tire pressure alert also comes standard to let you know if the tire pressure is low.